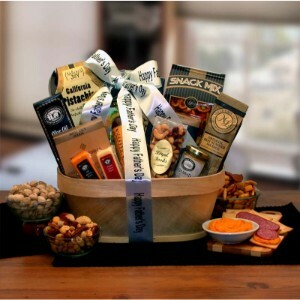 Includes: Zesty cheddar cheese spread, Camembert cheese spread, 5 oz, summer sausage, 5 oz beef salami, deluxe mixed nuts, smoked almonds, salted pistachios, three pepper crackers, sea salt and olive oil crackers, grained mustard, deluxe snack mix, pine tray. Completed with cellophane and a hand tied Happy Father's Day bow. Completed gift measures 10" long by 7" wide and 13" tall and weighs 4 pounds.